The Classmate PC is the latest version of the netbook designed specifically for K-12 use. 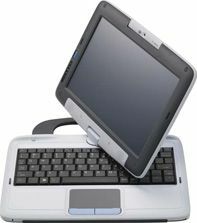 The new model combines a compact netbook with a user-friendly tablet, making this product ideal for school 1:1 programs. The most dramatic upgrade is the convertible aspect: Rotate the display 180 degrees and fold. The netbook is now a fully functional tablet with touch-screen capabilities. The screen also automatically adjusts from portrait to landscape modes. into a tablet; the Blue Dolphin interface, which brings the learning tools right to the student without their having to wrestle with Windows; and the Webcam, which works in both tablet and clamshell mode. The handle and rugged casing should give teachers comfort in handing this machine over to children. CONS: The student reviewer had a hard time figuring out how turn the device on at first (lower-left-hand-side switch). The touch screen is more difficult to use for those who are used to a “feather touch” screen. Intel developers explained that the “palm-resistant” technology makes it possible for students to write in applications using the tablet mode. Depending on the application, this can be either a hassle or a feature. The problems were mostly solved when using the included stylus or fingernail. Note to developers: Get a tether on that stylus! OVERALL IMPRESSION: An impressive upgrade of an already strong product. Switching the device from clamshell to tablet and back again is more than a novelty. The design gives the Classmate much greater versatility as a learning tool.